YouTube has signed a deal to host 4,000 hours of classic US TV shows, legally, on its site. The website signed an agreement with Digital Music Group which allows the site to host the shows. The agreement also requires YouTube to purge its database of videos containing music content by the group. Digital Music Group is a digital media company organising the encoding, protecting and distribution of independently owned content. They provide media to places like iTunes , Google Video , Napster and Wal-Mart. Thanks to the new deal between YouTube and Digital Music Group, you will now be able to find clips of programmes like Gumby and I Spy - shows that aren't well known in the UK. 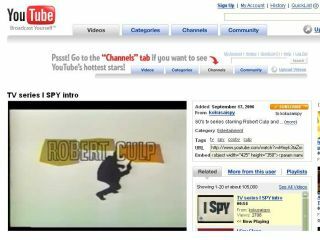 Since being bought by Google , YouTube has had many of its videos challenged by copyright holders. The site has removed a lot of content as well as signing content agreements with other movie, music and TV studios.